The students who took part in the workshop yesterday. KOTA KINABALU: Sabah’s coast is faced with the ever-present danger of being hit by a tsunami. According to a record in the Philippines, the east and northern parts of Sabah were hit by a tsunami as high as two meters on September 21, 1897 which resulted from a 7.5 magnitude earthquake at the Sulu Sea in Zamboanga, Philippines, said Universiti Malaysia Sabah (UMS) geologist, Professor Dr Felix Tongkul. He added that the sources of tsunami that can hit Sabah are the Manila Trenches, Mindoro Trenches, Cotabato Trenches and North Sulawesi Trenches, as well as from landslides/soil erosion that occurred at the slopes in the South China Sea. He also said that tsunami simulations carried out indicated that the tsunami waves between the height of one to five meters can reach Sabah between 30 to 120 minutes. Dr Felix also mentioned that the threat of tsunami in Tawau is great as most of its topography is low and the district is exposed to tsunami waves from the Sulawesi sea, which is also located close to the source of the tsunami. He said that because of that, the communities residing in Tawau need to be vigilant and prepared in the event the district is hit by a tsunami in the future. Among others, he urged the communities to be aware of the things they need to do during a tsunami. He said that they must also identify the highest point nearest to them; and that if there was none, they need to move further inland since the strength of the tsunami dwindles as it moves inland. He also urged the community to familiarize themselves with the sound of the tsunami siren and to immediately move to higher ground or further inland when they hear it. Dr Felix also urged them to remain where they are until they receive information that the tsunami was over. He warned that the main tsunami can be followed with subsequent tsunami waves. Yesterday, Dr Felix was involved in an earthquake education workshop for primary school and secondary school students in Ranau. The event was held at SMK Ranau and was participated by 321 students from 16 schools. The event was organized by the Natural Disaster Research Centre (NDRC) and Universiti Malaysia Sabah (UMS) with sponsorship from UNICEF Malaysia. Students seeking shelter under their desks during the earthquake drill at the workshop. 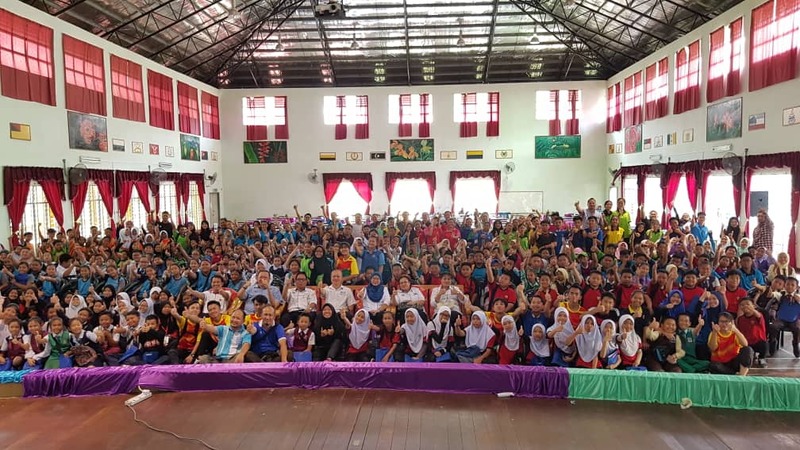 State Education Department director Datuk Maimunah Suhaibul has expressed her support for the programme and stated that it helped prepare the students to face disaster.